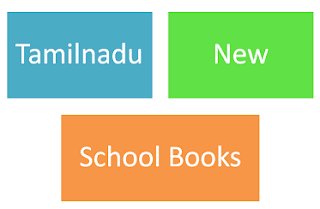 Books are being updated day by day....please visit the above link to download Tamilnadu New School Text Books. According a news article in DInamani, 14-12-2018, the New School Book Preparation Works for 2nd, 7th, 10th and 12th standards are going on at SCERT, Chennai. The works are expected to be finished with in January 2018. How to buy Tamilnadu New School Books Online ? Tamil Nadu Text Books and Educational Services Corporation has provided facility to buy new School Books Online through its official website https://textbookcorp.in/users/student_login . The books will be delivered with in 48 hours. You can pay the price online. Plus One new books are now available for sale in the Tamilnadu Text Book Corporation Sales Outlets in DPI Campus, Nungampakkam, Chennai and Anna Centenary Library and other places from 11th June 2018. Tamilnadu News School Books for 1,6,9,11 Standards PDF can be downloaded from State Council of Educational Research and Training (SCERT) Website. Tamilnadu New School Books Sale Started from 25th May 2018 : 1,6,9 Standard Books are being sold at DPI Campus, Nungambakkam. Online Sale of 1st, 6th and 9th Standards started from 24-05-2018. Students can register and buy the book through Tamilnadu Text Book Corporation Official Website https://www.textbookcorp.in . Note : It is notified that 11th Standard Books Online Sale will begin from second week of June 2018. When the Tamilnadu New School Books available online / offline ? The new School Books of 1,6,9,11 standards can be downloaded from online on 23rd May 2018 (Website link will be updated shortly) . The hard copy of the books can be purchased from Text Book Corporation Sales outlet at DPI Campus, Nungampakkam and Anna Centenary Library, Kotturpuram in the last week of May 2018. 04-05-2018 :Honourable Chief Minister Edappadi K. Palaniswami released Tamilnadu New School Books of 1st , 6th, 9th and 11th Standards on 4th May 2018. School Education Department has planned training programs for teachers on handling new school books from 1st June 2018 to 15th June 2018. The new school books of 1st, 6th, 9th and 11th standards are going to be implemented from this academic year (2018-2019) itself. 2nd, 7th, 10th and 12th standard new books will be implemented from 2019-2020 academic year and other standards will get new books in the next consecutive year. 07-04-2018 : New Syllabus, Books are to be implemented from next academic year - Hon'ble School Education Minister. The Minister has informed in his recent press meeting that the new books for the 1,6,9,11 standards will be released in the last week of May 2018. 16-03-2018 : 6th, 9th and 11th Standard New Books Printing Works have been started. Asper the news published in the Dinathanthi newspaper, it is said that, 1-9 standard books are being printed in 7 languages and 10-12 standard books in Tamil and English languages. It is all set to print the books needed for April month will be printed and send the books to all schools. As per Tamilnadu Government's new Curriculum Development plan, 1,6,9 and 11th Standard School Books preparation works should be completed with in this April 2018. In the first phase, the complete work of 1st and 9th standard books is completed and the CD's of the same has been released by the Hon'ble School Education Minister. The CD has been handed over to MD, Text Book Corporation for proceeding the Printing of the Book. Government of Tamil Nadu formed School Syllabus Framing Committee for the revision of school education curriculam for 1st to 12th standards. According to the decission of the Government, the following Class Syllabusses are to be completed in the given time frame. 2. Dr. E. Sundaramoorthy, Former Vice Chancellor, Tamil University, Tanjore. 3. Dr. K. Ramasamy, Vice Chancellor, Agricultural University, Coimbatore. 6. Dr. R. Balasubramanian, Professor and Head of the Department,Chennai. 7. Dr. Kala Vijayakumar,Educationist, Chennai. 8. Thiru Trotsky Marudhu, Artist, Chennai. 9. Dr. G. Arivoli, Director, SCERT, Chennai is the Member-Secretary. 1. Secretary, School Education, Tamil Nadu. 2. Dr. E. Balagurusamy, Former Vice Chancellor, Anna University, Chennai. 3. Dr. Mayilsamy Annadurai, Director, ISRO, Bengaluru. 4. Dr. M.P. Vijayakumar, Retd. I.A.S. 6. Dr. C. Subramanian, Former Vice Chancellor, Tamil University, Thanjavur. 7. Dr. A. Jothimurugan, Vice Chancellor, Thiruvalluvar University, Vellore. 8. Dr. S. Anathalakshmi, Educationist, Chennai. 9. Dr. G. Balasubramanian Former Director,CBSC,Chennai. 10. Director, Directorate of School Education. 11. Director, Directorate of Elementary Education. 2. Sub-committee for Curriculam Development of Arts and Humanities.